The newly released National Climate Assessment spans 30 chapters with thousands of references on how climate change is impacting the U.S. The report took more than 300 scientists and 4 years to prepare, including addressing more than 4,000 comments from the public. The message of the report is that climate change is already happening across the country. “Climate change is not a distant threat, it is already affecting every region of the country and key sectors of the economy. This national climate assessment is the loudest and clearest alarm bell to date,” White House science advisor John Holdren said in a phone call with reporters. That message is reinforced by a number of powerful images in the report. To understand the changes that are already occurring and what's projected for the future, here are eight of the report's most compelling graphics that each tell a chapter of the global warming story. What it shows: Average temperatures have already risen in the U.S. by 1.5°F since 1895 with over 80 percent of the increase coming since 1980. But the increase hasn’t been even. Temperatures have risen particularly fast in the Midwest, Southwest, and Alaska. While the Southeast has lagged behind that pace, it too is still warming. 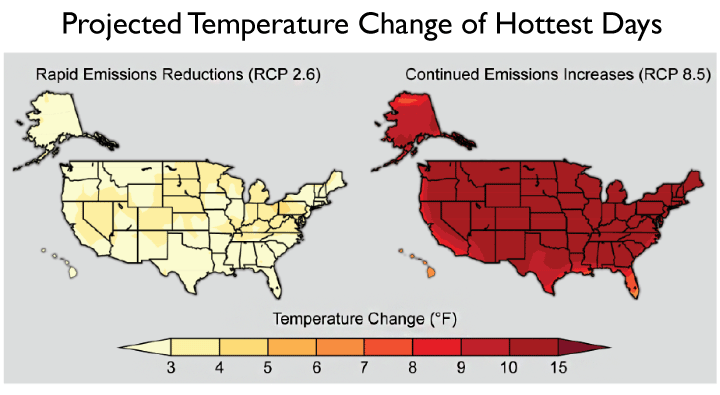 Why it matters: Increases in average temperature over large areas is one of the main benchmarks of climate change, but it's important to remember that each region of the U.S. will have to deal with differing rates of change. It's also important to remember that warming is expected to intensify and temperatures could rise by up to 10°F by the end of the century. 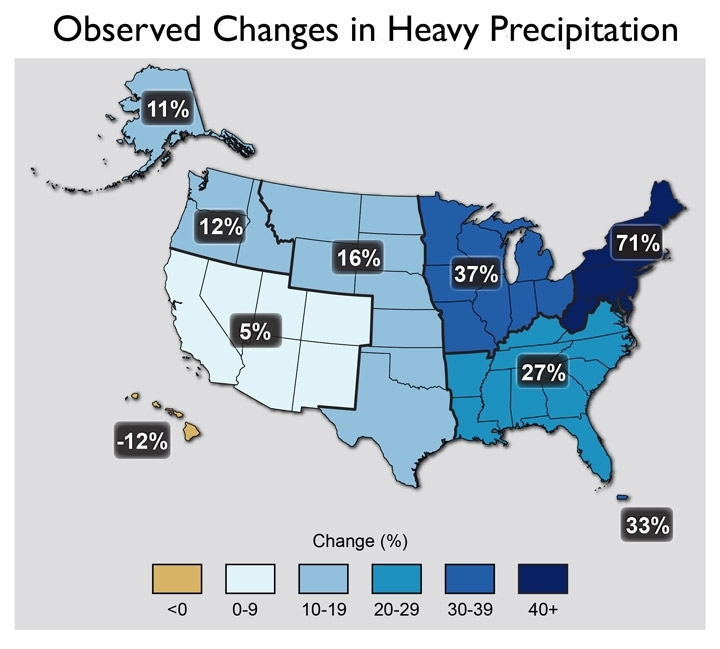 What it shows: Heavy precipitation events are dropping even more rain and occurring more often. The Northeast has seen the most notable rise in the amount of precipitation falling from very heavy events, with a 71 percent increase from 1958-2012. Every region of the country except Hawaii has seen at least some increase. Why it matters: Heavy precipitation can overwhelm stormwater infrastructure and increase the chances of flooding. Recent examples of extreme rainfall events that have caused serious damage in the U.S. include last year's Colorado floods and last week's deluge in Pensacola. While they haven't been tied to climate change specifically, they're in line with climate trends. What it shows: The hottest days are going to get hotter and dramatically so if carbon emissions aren’t curtailed. 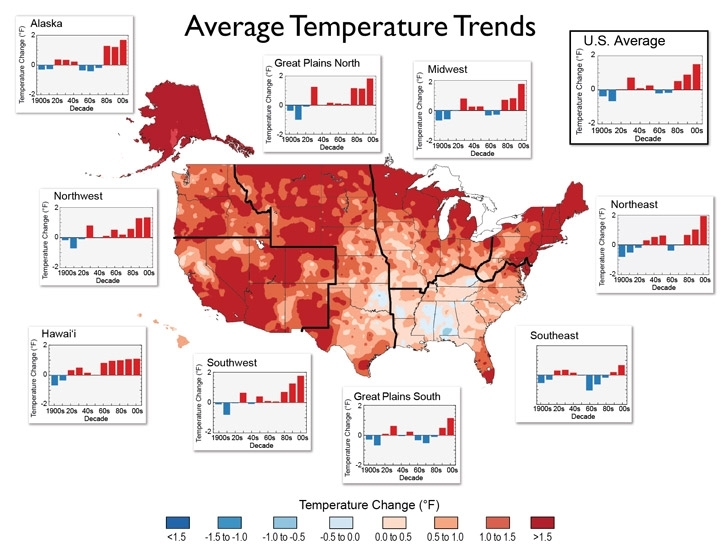 The maps show the projected temperature changes to the hottest days, defined as days so hot they occur only once every 20 years, by the end of the century relative to 1986-2005. Under the high emissions scenario, the hottest days will be 10-15°F hotter. Globally, extreme heat has been rising sharply over the past 15 years. Why it matters: That might sound appealing in winter, but during the summer months, extreme heat and heat waves are already a major health concern, particularly for the elderly and the urban poor who might not have access to air conditioning. Heat is the leading weather killer in the U.S. Adding more heat stress could make a bad problem worse. 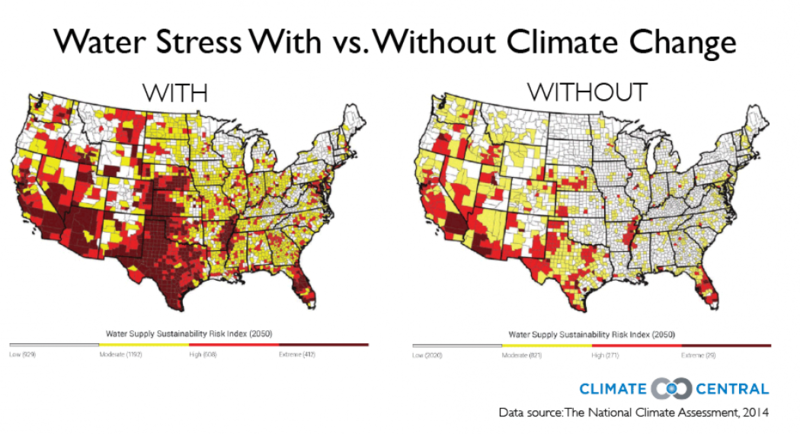 What it shows: Climate change will stress water resources. Water systems throughout the Texas, Oklahoma and the West are particularly vulnerable to rising temperatures and shifts in precipitation that climate change is likely to bring. Why it matters: The western U.S. and Texas produce more than half of the country's fruits, nuts and vegetables and are home to some of the fastest growing cities in the country. By 2050, climate change is likely to put 32 percent of counties across the U.S. at risk of extreme water shortages. Today, that’s true for only 10 percent of counties. What it shows: Agricultural growing conditions are likely to change substantially across the U.S. Hot nights, consecutive dry days, and frost-free days are all expected to increase in nearly every part of the country. Why it matters: Water is the lifeblood of crops so any increase in dry days is likely to add to crop stress. Warmer weather, including hot nights, can speed crop growth but reduce overall productivity for some plants such as wheat and other cereal crops. What it shows: Energy demand to cool buildings has risen while heating demands have dropped since 1970. 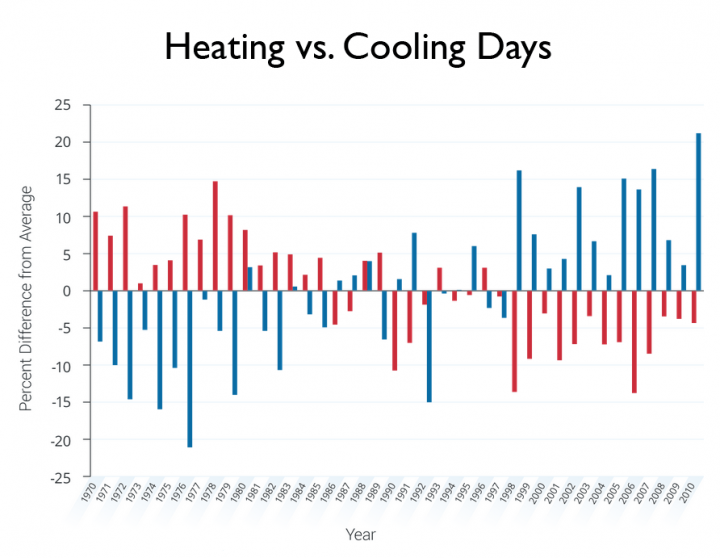 Why it matters: As temperatures continue to warm, we’ll require more and more energy for cooling in the summer months. That will increase peak loads and put more stress on energy infrastructure. What it shows: Some states are already planning for climate change and how to adapt to it. 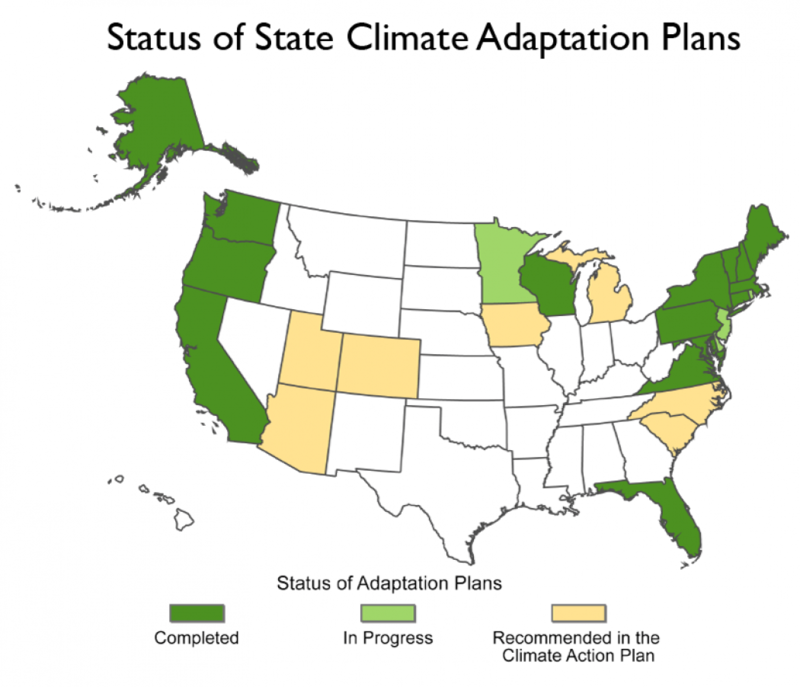 Of the 50 states, 15 have completed an adaptation plan already, 3 have one in progress, and 7 have made recommendations of how to create one. Why it matters: Climate change will have different impacts at the state and local level and it makes sense for states to consider those differences and plan accordingly. 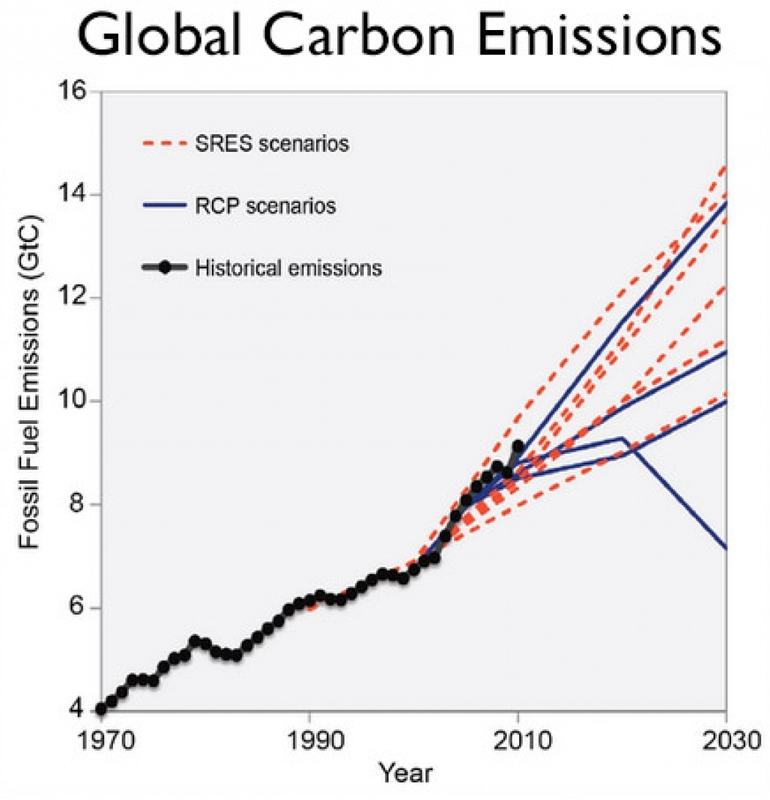 What it shows: Global carbon emissions have continued to rise and are on track to exceed even the highest emissions scenario climate scientists have created. Why it matters: Carbon dioxide and other greenhouse gas emissions from human activities are the main driver of climate change. Reducing them will be necessary to avoid the worst climate change impacts.